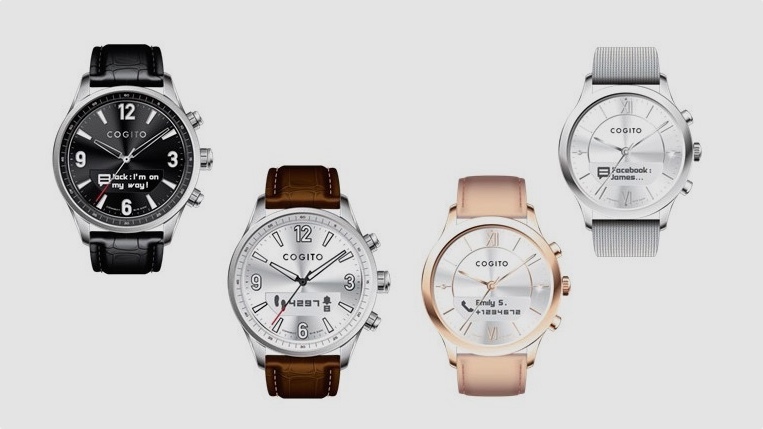 Cogito has launched a new smartwatch, with variations and sizes to suit both men and women. Unveiled at the Hong Kong Watch and Clock Fair, the so-far-unnamed Cogito blends an analogue watch face with a small OLED screen behind the hands, which is used for displaying notifications from a smartphone. It's the second such watch in the last week to offer a blend of analogue and digital, after the launch of the Runtastic Moment. The first version of the watch is 40mm – which is slightly smaller than the female aimed Moto 360 – and comes in silver and rose gold options, with the detailing on the face and numbers matching that on the case. That version comes with a 20mm strap in beige leather or a Milanese loop. However, there's a second 44mm version aimed at men, which in turn comes with a 22mm strap in brown leather. It features a more masculine stainless steel design. Aside from pairing with your smartphone to deliver notifications, there's also fitness tracking built in as well. Cogito says it's capable of determining three activity levels — very active, slightly active and rest — and the calories burned during exercise. Henri-Nicolas Oliver, CEO of Cogito said: "We don't believe it's necessary to compromise craftsmanship for connectivity. Both style and smarts are equally important in our connected watches. It's a core value in our design philosophy." It's not the company's first watch, and we reviewed the Cogito Pop back in 2014 – which blended a funky design with basic smarts. However, with fitness features, proper notifications and a design to suit both sexes, it might garner more attention this time around. The new Cogito smartwatch will go on sale in October for $199.